Looking for movie tickets? Enter your location to see which movie theaters are playing Hamlet – NT Live 10th Anniversary near you. This movie releases on July 8, 2019. Sign up for a FanAlert and be the first to know when tickets and other exclusives are available in your area. 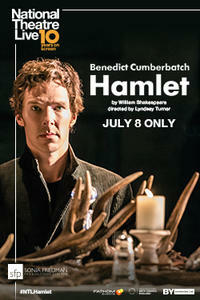 Benedict Cumberbatch plays the title role in a stage production of Shakespeare's tragedy "Hamlet." Come back and tell us what you think! Shakespeare's great tragedy -- all of it.